Order the PDF ebook version of 1001 Ways to Market Your Books, Real World Edition by John Kremer by clicking on the title or the following link: http://bookm.link/1001e. Would you like to order the new print edition now? You can do it here: 1001 Ways to Market Your Books, Real World print edition: $27.95 – Click here to order! 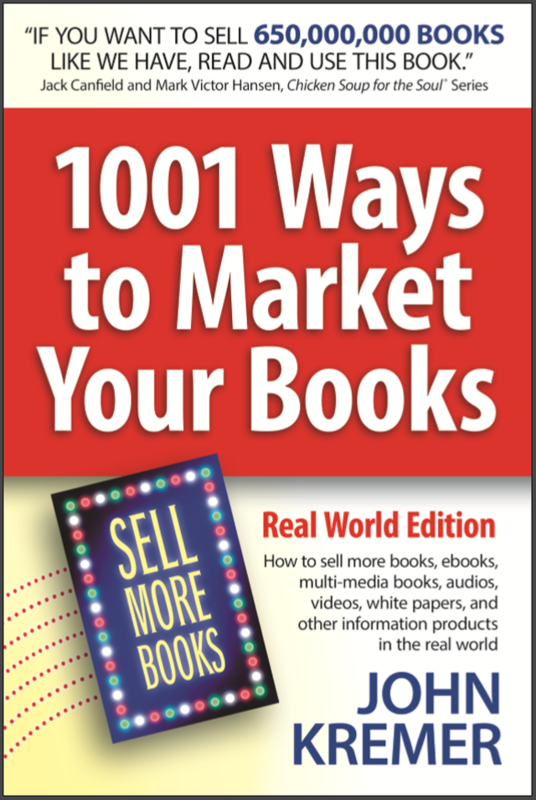 Book Marketing Tips: Check out the book cover for the new Real World Edition of 1001 Ways to Market Your Books by John Kremer. Note: The new edition (650 pages) is shipping now. Even among the ink-on-paper crowd, the trade book sector is among the most backwards of the publishing verticals with regard to innovation. And what exactly do they do: talent discovery, editing, marketing, sales and distribution. As I learnt when working with jetwriters, they're simply a middleman in the value chain. And companies like Amazon, which are extraordinarily good executors (much better than any publisher), can do some of these tasks well and at lower costs. And authors will be able to find other parties to handle the rest. Few people buy a book because it's this imprint or that (with rare exceptions like Harlequin). So brand, unlike in magazines and newspapers where people really do buy based on the company's name, really isn't something that publishers can lean on among consumers. Trade publishers need to stop luxuriously lunching at Michael's and figure out exactly where their value-add is and should be. I suspect the Big Six will be the Little Three or Four a decade from now.